The Gal�pagos Islands are one of the most unique and extraordinary destinations in world travel. Lying in splendid isolation 1000km off Ecuador's Pacific Coast on the Equator, the 'Enchanted Isles' are home to a fantastic array of unusual animals, birds and plants. The studies of these species by Charles Darwin, who arrived here in 1835 on board the HMS Beagle, led to the formulation of the theory of evolution by natural selection, one of the greatest breakthroughs in science. The animals have no fear of humans so you can get very close to sea turtles, penguins, sea lions, giant tortoises and marine iguanas that are the symbols of the Galapagos. Birdlife viewing here is equally unparalleled in numbers, diversity and sheer uniqueness with blue-footed boobies, waved albatross, and the pterodactyl-like frigate birds just some of the incredible species found here. Exploring by boat some or all of the nineteen major islands that form the archipelago will be one of the most memorable journeys you'll ever take. Santa Cruz is the second largest and most populated of the Galapagos Islands. The town of Puerto Ayora on the island's south coast is home to the Charles Darwin Research Centre, founded in 1964, where there is the giant tortoise research and breeding program as well as exhibits on Darwin's voyages and research, the islands' geology and species evolution and current conservation efforts. You can observe the adult tortoises of the breeding program as well as the young tortoises in the nursery. 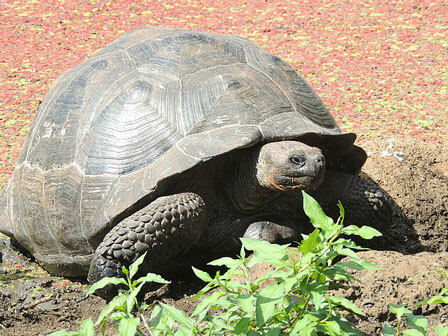 The tortoises can weight up to 250kg and live for up to 200 years. The highlands of Santa Cruz are also worthy of exploration, a humid environment of endemic plants and volcanic landscapes, including lava tubes. This is the natural habitat of the giant tortoise and you may get to see some in the wild (one of only two locations on Galapagos, Isabella being the other), in addition to bird species such as finches, cuckoos, vermilion flycatchers and yellow warblers. On Santa Cruz's northern coast is the beautiful beach of Las Bachas, a major egg-laying site for sea turtles, as well as a home for marine iguanas and pink flamingos. North Seymour is located just off the north coast of Santa Cruz and is one of the most visited islands in Galapagos and one of the most exciting photographically. Animals resident here include sea lions, marine iguanas, Gal�pagos mockingbirds, swallow-tailed gulls and blue-footed boobies. Amongst the numerous bird species are Galapagos�s largest nesting colony of the magnificent frigate birds, whose ostentatious mating ritual can be regularly seen. 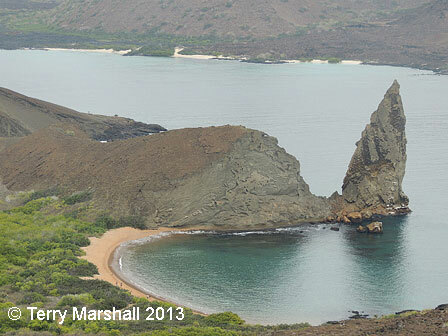 South Plaza is one of the smallest of the Galapagos Islands, one of a pair of islets just east of Santa Cruz. 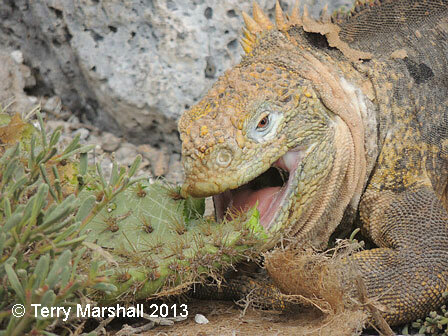 It has one of the largest populations of land iguanas, as well as marine iguanas, sea lions, swallow-tailed gulls, frigate birds, shearwaters, brown pelicans, blue-footed and masked boobies. There is a trail through the island's cactus forest to view the wildlife. The small island of Sante Fe is located south-east of Santa Cruz. Santa Fe is renowned for its intriguing forest of giant Prickly Pear Cactus and its population of inquisitive sea lions. The waters off the island are also home to sea turtles with opportunities for snorkelling and swimming amongst the marine life while on land species include Sante Fe land iguanas and Galapagos snakes. The east coast of Santiago was frequented by whalers and pirates in the 18th and 19th centuries and Darwin camped here at Buccaneer's Cove during his explorations. At Puerto Egas there are many tidal pools formed from ancient lava flow which are home to sponges, snails, hermit crabs, barnacles and fish. Other species found here include sea turtles, marine iguanas, flamingos, white-cheeked pintails, American oystercatchers, ruddy turnstones and fur seals. The eastern side of the island around Sullivan's Bay is a rugged and barren landscape, covered by a lava flow less than one hundred years old. 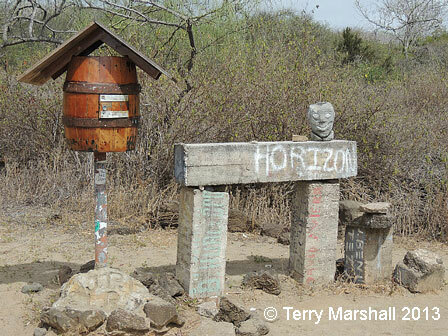 Bartolom� is located off the eastern shores of Santiago Island. A hike to the summit of the island (114m) provides a fantastic panoramic view which is amongst the best in Galapagos - the much photographed Pinnacle Rock (a volcanic tower rising out of the water), the island's lunar-like volcanic landscapes, the double-sided beach of Bartolom� below and Santiago in the distance. From the beach, there are great snorkelling opportunities among the submerged volcanic rock and near the tower base. On Bartolom� you may spot the rare Galapagos penguins, of which only 800 pairs exist, while marine turtles nest on the beach from January through March. The tiny island of Sombrero Chino (Chinese Hat Island, so called due to its shape) is located off the south-east coast of Santiago. Its beach is home to sea lions, penguins and Sally Lightfoot crabs with excellent waters for snorkelling. The small island of Rabida is located to the south of Santiago and is one of the most volcanically active of the Galapagos Islands. The island is noted for its reddish beach, cliffs and steep volcanic slopes. The wildlife found on Rabida includes sea lions, flamingos, blue-footed boobies, Galapagos penguins, white tipped reef sharks and 9 types of Darwin's finches. Floreana is an island with a long and intriguing history of settlement and as a base for 18th century whalers. Post Office Bay has a post barrel that was used by the whalers - outbound vessels would deposit mail for home in the barrel and home bound vessels would collect mail for their part of the world. The barrel is still in use today for tourists. Floreana has a dependable water supply and nutrient-rich soil giving it abundant plant life including palo santo trees, cutleaf daisy, lantana shrubs and scalesia. At Punta Cormoran on the northern tip of the island the green sand beach leads to a lagoon with populations of flamingo, pintail duck, common stilt and brown pelican. The waters around the Devil's Crown are ideal for snorkelling with numerous colourful fish and sea lions. Galapagos penguins, sea turtles, Galapagos sharks, stingrays and hammerhead sharks are some of the other species found in or near the waters of the island. Espanola is the southernmost of the Galapagos Islands and has one of the wildest natural landscapes in the archipelago. The jagged cliffs of Punta Suarez on the western side of the island are a spectacular sight with huge waves crashing against them. Another dramatic feature is the blowhole that throws seawater up to 20 metres in the air. Gardner Bay has a beautiful, long stretch of white sandy beach that's a great spot of swimming and snorkelling amidst sea lions, marine iguanas and a huge variety of fish, including surgeon and angelfish. The variety of birdlife on Espanola is huge. 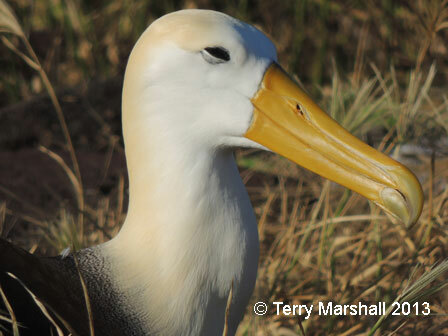 The island is the nesting site of almost the entire world population of waved albatross with more than 12000 pairs residing here between April and December. There are also large numbers of masked and blue-footed boobies, yellow warblers, Galapagos doves, hood mockingbirds, red-billed tropicbirds, swallow-tailed gulls, oystercatchers, Galapagos hawks and large cactus finches. The eastern island of San Cristobal is home to the provincial capital Puerto Paquerizo Moreno and the Galapagos Park Visitor Centre which has exhibits on the history and biodiversity of the islands. 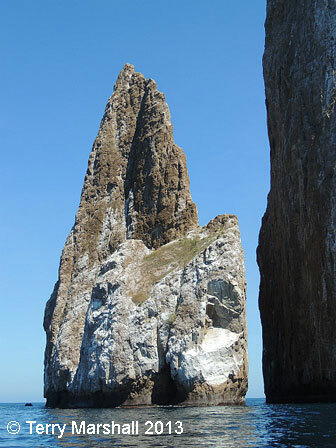 Leon Dormido, or Kicker Rock, off the coast of San Cristobal is a dramatic volcanic formation of two vertical towers climbing 160 metres in the air with a narrow navigable channel between them. Blue-footed and nazca Boobies and frigate birds cover the rock formations. Cerro Brujo on the island has colonies of sea lions and opportunities for hiking and snorkelling in the area. Isabela is the largest of the Galapagos Islands, 125km long, and is formed from five volcanoes of which two are still active. It is the best site in the Galapagos for trekking, with the climb to the top of the Sierra Negra Volcano in the south of the island being the highlight. The caldera here is 12km wide and the second largest in the world after the Ngorongoro Crater in Tanzania. From the summit there are spectacular views across the north of the island and towards Santiago to the northeast. Close to the caldera lies Volcano Chico which is extremely active and constantly emitting sulphurous gases. The nearby Tintoreras Islands can be reached on small boats to view marine iguanas, giant turtles, Galapagos penguins and sea lions as well as many bird species. 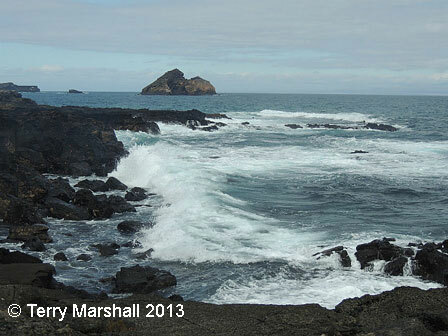 Genovesa lies at the north-eastern edge of the Galapagos archipelago and is off most tourist itineries. This makes it one of the wildest and best preserved of the islands. It is approached by entering the perfect horse-shoe shape of Darwin's Bay. There are excellent bird viewing opportunities on Genovesa, with up to 140,000 pairs of red-footed boobies nesting here in addition to lava gulls, turnstones, whimbrels, tattlers and night herons. 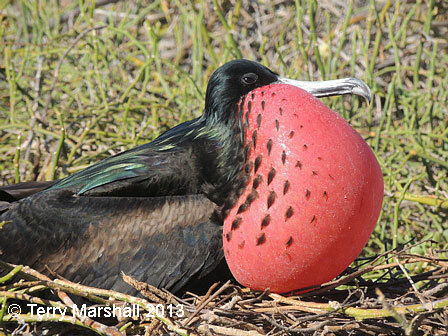 Prince Phillips Steps is also an excellent site for viewing great frigate birds, masked boobies and blue-footed boobies and storm petrels. 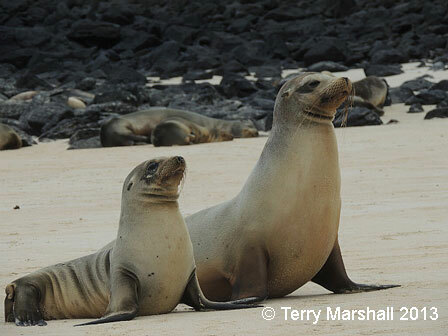 Organised group tours: Click here to see 46 tours to Galapagos Islands which may include Galapagos Islands.